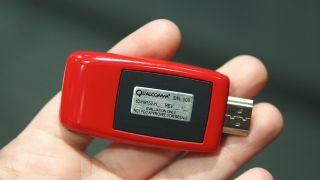 As the move to 4K video gets under-way, Qualcomm has announced a streaming stick that uses its Snapdragon 800 processor to deliver UHD video to your TV. The device is currently a reference design, so it's not actually available to buy, and like most of Qualcomm's hardware, it probably won't be. What it does is demonstrate what's possible, and allow other companies to make their own using Qualcomm's reference design. There's also the chance that those making this device might perhaps opt to boost its power with the Snapdragon 810, which is just starting to arrive in devices now. In the prototype, the stick runs a full version of Android. This gives the option for everything from a fully-featured device, to a very simple streamer - much like Chromecast. But letting our imagination have some fun for a moment, it could also be used for Android TV. What's interesting here though, is that as well as normal Wi-Fi, there's also the option to use LTE broadcast. This could allow a mobile operator to send TV over the air to subscribers, using 4G frequencies, but like a traditional broadcast, it would be received by large numbers of people at the same time. The stick can also use 5GHz frequencies to create a localised version of LTE. This allows much greater capacity for 4G networks, and would allow far more bandwidth to be utilized. That's pretty crucial when you're on about moving large videos around the planet. SlashGear has seen the early prototype, and suggests that pricing would be competitive - so imagine around £30 ($46US, $59AU) to £50 ($76US , $99AU) depending on the features included. For 4K, there's not much else about, so if manufacturers start producing these soon, it could do very well and offer a cheap way to get 4K content.